In the previous installment about Hovawarts and Temperament I mentioned how responsible Hovawart breeders have the temperament of their puppies tested. What did this test reveal about Kenzo? And did the test help us understand Kenzo better? When we visited Kenzo's breeder for the first time, we met both Kenzo and one more Hovawart puppy, his brother "Izak". At 12 weeks old, they were the litter left-overs. The families they were destined to join had regretted their decision. While Kenzo's brother continued to interact with us, growling, biting my shoe-laces and jumping up, Kenzo had retreated to the garden after a first greet. There he laid down, leaning on a fence, and enjoyed the view he had over the fields. Still playing with his brother, I asked the breeder which one he would recommend, considering we would become first-time Hovawart owners. He nodded over to Kenzo, "That one", he said, and added, "He is more mellow". Would it be my newbie decision, I would have chosen Izak, but I followed the breeder's advice. When we took Kenzo home, we also got a copy of his temperament test report. Over time I became fascinated by it, as the test confirmed some of the things we started to observe with Kenzo. In short, Kenzo missed most of the "desired" behaviors in the test that would qualify him as a working Hovawart. He remained cautious in his contact towards the tester during the contact tests. He was interested in the ball used for the prey drive test, but sniffed it before grabbing it. In the fight drive test he cautiously took hold of the object but quickly released again. Overall, his drive was low in these areas. No need to say, that his brother Izak scored high values. In the social- and stress tests he did very well. He was an active, calm and balanced participant and used most of the time for the test to engage and showed no signs of stress. In the defense tests Kenzo displayed a high drive, he made no flight attempts neither did he respond with aggression. There was a little defender already present in that small puppy. We soon experienced, like the test predicted, that Kenzo is a little reserved and craves some encouragement. He needs time to think things over. He remains cautious towards people he doesn't know, even if they would come with his favorite toy. When he gets a new bone or treat, he first takes a short sniff, before he gently takes it. Any new thing we bring in the house, from coffee-machine to doormat, has to be investigated thoroughly. He chases squirrels but has never hurt one despite ample opportunity. Even when he catches one, he quickly releases. Kenzo doesn't value resources. His favorite toy, or place to sleep, is happily shared with Viva, and before her, with any dog that visited. In our "Shutzhund" class it also became very obvious. When Kenzo was presented with the "guy with the arm" he grabbed it cautiously and quickly released again. It took a couple of additional sessions for him to understand that this was a game and getting hold of the arm was fun. The day we got a replacement trainer, he didn't bite, as he had to think over this new situation. In all types of training we did in the past or still do today, like obedience and tracking, Kenzo needs encouragement and some time to solve a problem. I learned not to try to help him, as he will only look up at me for guidance and I want him to do the problem-solving himself. He is quickly labeled as "shy, not confident" but that is not true. He just needs some encouragement and a little more time, and maybe allow him a second or third try. One of our trainers who knows Kenzo since puppy hood takes pride in always giving Kenzo a new puzzle to solve. We both enjoy seeing him go through his elaborate thinking process. The test also predicted a little defender. And indeed, Kenzo does not need a lot of thinking when we have an unexpected visitor on an unexpected place. On the contrary, he is as fast as lightning. Kenzo has by now made a number of "arrests" - he stops a person and keeps them on the same spot until I arrive - in which he judged a person as a threat. Maybe you remember his drugs-bust, but we also witnessed arrests where people would come on our property, or when a "suspicious" person would approach us or other people he knows very well, outdoors. When we were involved in an outdoors search exercise, the trainer I mentioned before was present in the search area. A Ranger suddenly appeared from behind a mud wall and walked straight to the trainer. She looked at the man while the expression on her face changed, probably wondering what the man wanted. Kenzo was the first of the group to notice this change in her expression. While I looked up to see what got his attention, he was already on his way to make his arrest. Although the trainer was very flattered and touched when Kenzo jumped in to "protect" her, Kenzo's high defense drive is something which is difficult to manage properly. When I am outside I am always aware of the surroundings, to prevent him from making any further arrests. If anything or anybody strikes me as odd, it is guaranteed Kenzo will be next to notice. It took a while, but when I let him know it is alright or recall him he listens fine and relaxes. It means a lot to him knowing I am aware of any "threat". The problem is when he notices something before I did and I therefore act too late, and he makes his own decision. Although I am certain he will not bite, people might understandably mistake it for getting attacked, maybe hit or kick him, and things could go wrong from there. The odd thing is that we also trained arrests on "Schutzhund" training, but on that stage he always refused to arrest any new person he did not know. Clearly he distinguishes between the two and only acts this way when he perceives something as a threat, as that is how he is wired. I am still grateful for the breeder, giving the advice for Kenzo as he did. For a first-time Hovawart owner, one drive is more than enough to manage. 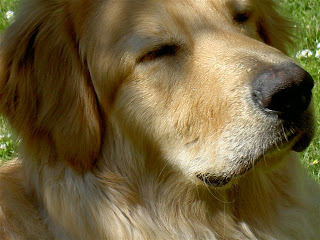 Each breed has a "desired" mental profile, which is closely tied to the job the dog originally was bred to perform. We have been anxiously awaiting the arrival of some snow. Could last year's snow fun repeat itself over here in Denmark? There is nothing like watching Kenzo & Viva catching the snow zoomies. I would sure hate to miss out on that. When a high-pressure over Siberia had temperatures plummeting all over Europe, our anxiety levels went equally on the rise, but snow continued to avoid this part of Denmark. Until last week, when we finally woke up to the sight of a landscape covered in white. Just a little, enough to cover a Hovawart paw, but snow nonetheless. We all rushed outside, only to stop abruptly as Viva came running back to us with a bleeding paw. One of her nails was hanging on a thread. We rushed to the emergency vet, who patched her up and gave us some antobiotics to prevent infection. The nail could be safed, Viva was lucky! On return, Viva went right back to play some more. Although slippery due to the plastic bag wrapped around her brand new red sock. We have been lucky before this winter. I found out we had run out of fuel and there was no heat. When we got the tank filled up again, the heaters refused to start and we had to call a repair-man. It took a little week before the heat was restored while the temperature outside was well below -20C/-4F. 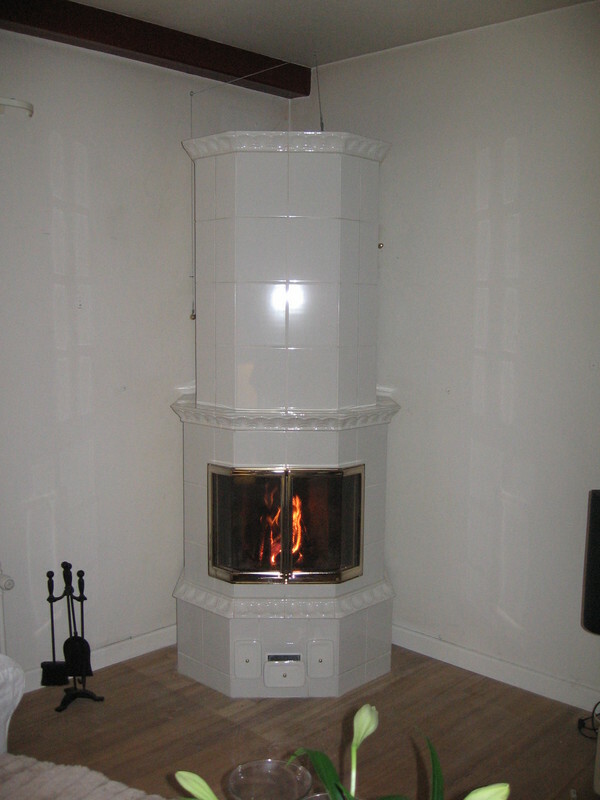 But we have one of those traditional Scandinavian Masonry Heaters that runs on wood, and the whole family camped around it for a couple of days, enjoying the warmth and the company. We pretended to have our own little winter adventure, sipping on some Glögg and with two Hovawarts on guard to keep the trolls at bay. It seems we have everything winter could bring covered now. We are ready for spring to arrive! I am very excited to introduce you to a very versatile Hovawart Wizard, Astrid! I first met Astrid on Twitter and have always been amazed by her energy and the diversity of the activities she undertakes with her Hovawarts. From any kind of training to Search-and-Rescue (SAR) work, and everything in between. You name it: Astrid, Ayda and Zerline do it. Hovawart Wizard: My name is Astrid Reijerkerk and I live together with my partner René Berendse and our two at home living kids, daughter Caitlin ( 22) and son Brendan (14). We live in Purmerend, a village near Amsterdam, Holland. I have a website, and we are on Facebook and Twitter as well. Recently I also started my own dog training school: "De Spoorlijn" (in English: "the tracking line")! I didn't thrived anymore on the local school where I was giving classes and it was always one of my dreams to have my own dog training school. 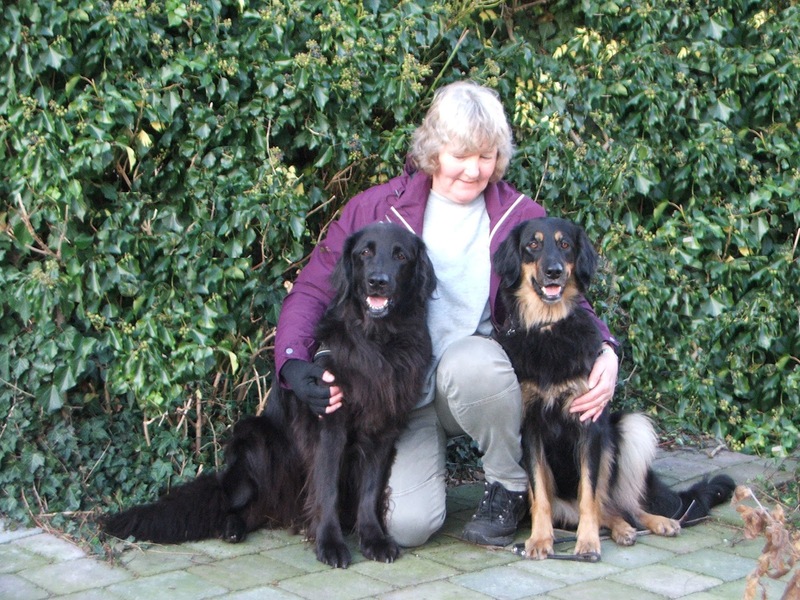 Hovawarts: We have 3 dogs, a female mixed dog from 16 years old and our two female Hovawarts, 10 year old Ayda, "Ajonja von der Tegelkuhle", and 3½ year old Zerline, "Dratini’s Bayleef". I got both as a puppy from a breeder. Ayda comes from a breeder in Germany and Zerline from a breeder in Norway. Ayda and Zerline are related to each other, Zerline's father is Ayda's half-brother. Ayda is spayed but Zerline is not. One of my other big wishes was to let one of my dogs to have a litter. We therefore got Zerline checked for hip-dysplasia (HD), had her eyes tested, passed a mental-test, a Canine Good Citizen Test+, and showed her. This is all required by the Dutch Hovawart Club. Finally, in March last year, Zerline became the mother of 8 puppy’s! We are still in touch with all the families and have regular "family reunions". The daily life of my dogs starts with a walk in the morning before I go to my job and in the afternoon we walk again. During the week we train with them as well, I train obedience and my daughter trains agility. Every Sunday we have SAR training and sometimes we have to search for missing people. We have even been on missions abroad in Spain and Norway. 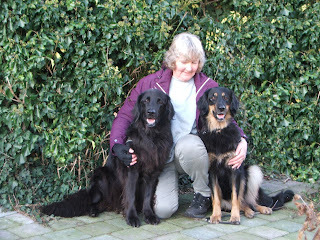 Both dogs are trained SAR dogs and we volunteer for the biggest rescue organization in Holland. Unfortunately Ayda cannot join me anymore because her vocal cords had to be surgically removed. But Zerline is still with me on missions. Like last week, when we had to search for a missing person, together with other rescue groups. The dogs seem to know when it is for training and when it is for real. We always start by letting the dogs take the scent of all the people in the group so they know their scents can be discarded. The missing lady was found very quickly though by another group, and we let the dogs find one of the handlers instead. Zerline deemed this to be very odd and tried to convince me this was a real search and she was certain this person was part of the group before! Both dogs are kind with other people. Where Ayda only really cares for the people she already knows, Zerline just likes everybody. Zerline likes other dogs as well and always wants to play with them. Ayda needs her space: she barks at other dogs and she doesn't want to interact with them. I love the breed because they enjoy doing things with me. We have developed such a deep bond together during the years of rescue work. It is difficult for me to describe in words what they have come to mean to me. Especially Ayda. She really is my best buddy, we share such a strong and deep bond. In a way I think it was Ayda that picked us instead of the other way around. When we couldn't find a puppy in Holland, and drove to the breeder in Germany - a 10 hour car trip - to "just have a look", we decided to stay and played with the puppies the entire weekend. During that weekend Ayda just picked us, and she was the one to drive home with us. My message to future Hovawart owners would be that with a Hovawart respect is key. But it doesn't come for free, you have to show respect for your Hovawart before you can receive their respect in return. This means to stand side by side, and not above, your Hovawart. To be consistent yet always fair and gentle. To never shout but to reward good behavior. Preferably with a lot of treats, the love of a Hovawart goes through it's stomach! Hovawart Wizards, like Astrid, try to provide real life information for Muggles - those not yet touched by the Hovawart's magic - to learn more about Hovawarts in the Hovawart School of Witchcraft & Wizardry. A place where Muggles can read how we play, what kind of training and activities we undertake. What makes Hovawarts special to us, and how they made us into Wizards. The role they came to play in our lives. And the hard times we shared. Helping Muggles to make the best choice possible if a Hovawart could be the Magical Creature for them, or at least what to expect. Do you notice the little figure in the middle of the photo? 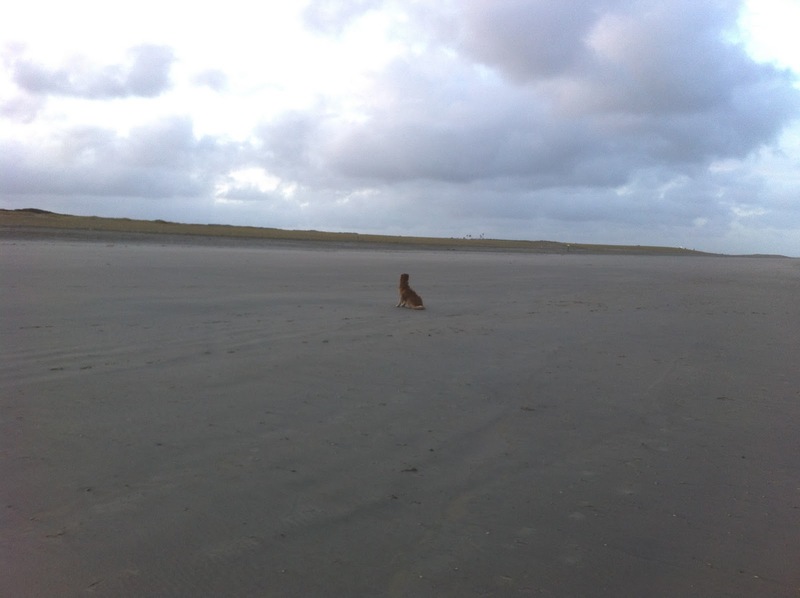 It is Kenzo on the beach we visited in Holland. He is looking at a path that leads down from the sand dunes onto the beach. From this path his pal Joska the Viszla - and my dad - usually appear. But they were late for the beach that day. Kenzo decided to sit down in front of the path and waited, in his best imitation of Hachikō. He sat down for 10 minutes, letting other dogs pass by, until they arrived. They have not always been that happy to see each other. Joska is very competitive towards other males, but fearful of them at the same time. It is like his testosterone is pushing him to act in a way he doesn't feel confident about. When Joska and Kenzo first met two years ago, Joska was not amused and very nervous. He only allowed Kenzo to showcase a full display of every calming signal in the book. Somehow, during some of those meetings in the past, Kenzo discovered Joska's soft spot. Joska and my dad love to play fetch above anything else. Even though Kenzo has a game of fetch low on his fav list, body-checking is still his uncontested number one, he recognized fetch as the key to forge a closer relationship with those two. And decided to favor the game's company over the game type. At first Kenzo was calm. Trying to appear not interested, as not to annoy Joska. Nowadays he is a fully accepted member of the fetch team. It took Kenzo more than a year in the smallest steps possible to get there. Desensitization carried out in perfection. Did you notice the mutual play bows - even my dad - and how they play with two balls in the game? Watching the three of them greet when they reunite after a long period of living apart in different countries and see how they engage in their own private game is a joy. For Joska it is very special that he can bond with another male dog. Kenzo does try to introduce the body-check into the game and he made a fine demo once. As soon as Joska was on his feet again he decided to avoid further demos, and give this new play concept some further thought. Like before, Kenzo never ceases to amaze me how he can make any dog feel good. Even if it takes him more than a year to achieve it. But a year is a small prize to pay for obtaining a real friend, as I realized when I saw him sitting on the beach, waiting for his new BFF.